It’s bittersweet, but here’s some good news! Save Gansevoort has won the Greenwich Village Society for Historic Preservation’s 2016 Regina Kellerman Award for Outstanding Work in Preservation. Admission is free, but please RSVP here. More information about the award is here. 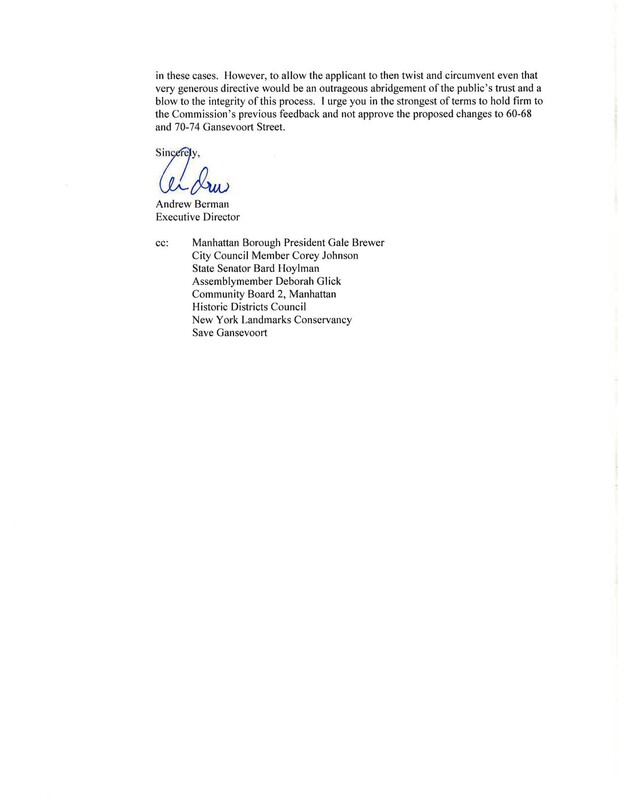 We’re greatly honored, and thank GVSHP for this acknowledgement of our work! 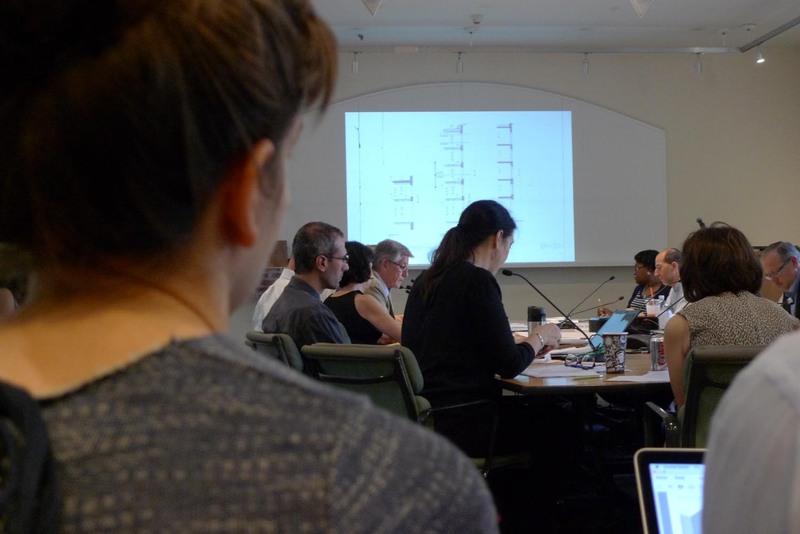 At Tuesday’s public meeting, the Landmarks Preservation Commission voted to approve Aurora Capital’s revised plan for their Gansevoort development (with two commissioners voting against approval). Although this is the end of the Landmarks process, the battle is not yet over. The developer will likely need to amend a restrictive declaration that currently exists on this site, and we will fight any attempt to do so. Thanks to the efforts of the many people who have worked so hard to oppose this project, the final plan is significantly improved compared to the initial application. 50 Gansevoort Street will be restored rather than demolished, and the small set-back one-story addition is nicely done. The revised design for 60-68 Gansevoort is a big improvement over the original proposal; in addition to the penthouse being removed, the building is now significantly lower and the facade is more appropriate to the character of the street. The removal of the huge two-story penthouse from 74 Gansevoort is an important change for the better, and the design of the building has been somewhat improved. 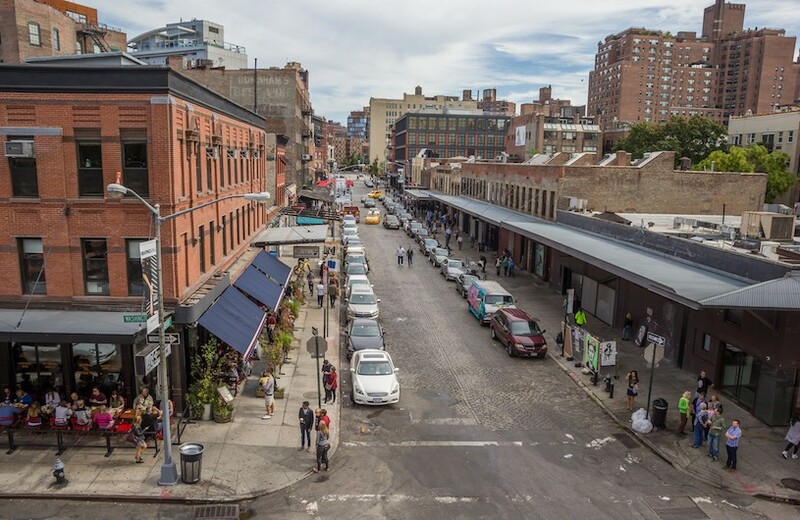 However, we remain dismayed that the intact, low-rise market architecture of the block is not being preserved, and believe that the new buildings at 60-68 and particularly 74 Gansevoort are way too high. It is deeply disturbing that in voting to approve this plan, the Landmarks commissioners ignored the guidelines they had established at their previous meeting (read our analysis of why the heights of the buildings in the revised plan failed to meet these guidelines here). 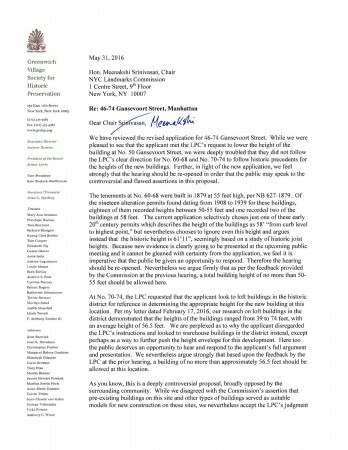 They did acknowledge the 30 Department of Buildings records that we found showing 50-55′ tenement heights, but most of the commissioners now dismissed concerns about the exact height of the tenements and indicated that an increase of 6-8 feet above these heights was acceptable. They allowed the developer to leave the height of the base building at 74 Gansevoort essentially unchanged, and to justify that height by comparing the building to the largest warehouse buildings in the district, despite having previously instructed that the new building at 74 Gansevoort should be reduced in height and compared to the (significantly smaller) loft buildings in the district. We are deeply disappointed in the Landmark Preservation Commission’s decision today to accept this massive building plan, disregarding the Gansevoort Market Historic District’s designation report and more than 75 years of history. 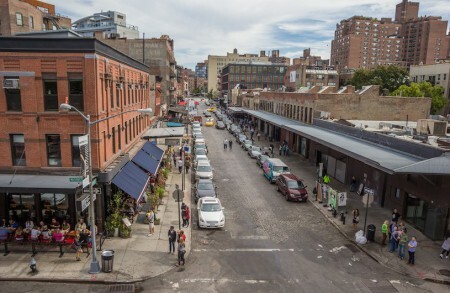 The Commission’s ruling will not only destroy the last intact block of one- and two-story, market-style structures in Manhattan, but it is also the latest sign that unrestricted development is killing the unique character of so many of our city’s most beautiful neighborhoods. 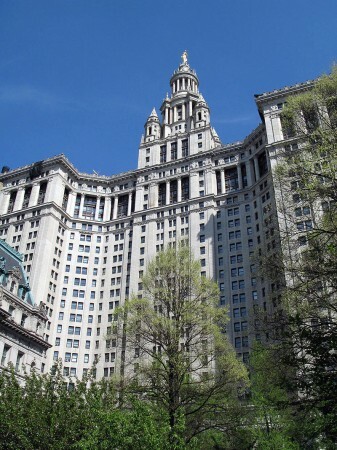 In this day and age, it is disconcerting that even our landmarked areas are no longer protected. Save Gansevoort will not give up the fight to protect our community. We urge the City Planning Commission and the City Council to block any amendments to the restrictive declaration on these sites that would permit the use of these buildings for office space. 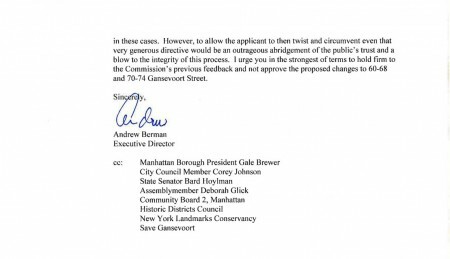 Preserving the restrictive declaration would prevent these developers from once again changing existing precedents to fit their bottom line and ensure that we can continue to save the Gansevoort Market Historic District. The restrictive declaration will be the next fight. We believe that if the developer is unable to amend the declaration, he will have great difficulties making this project economically viable. Stay tuned! 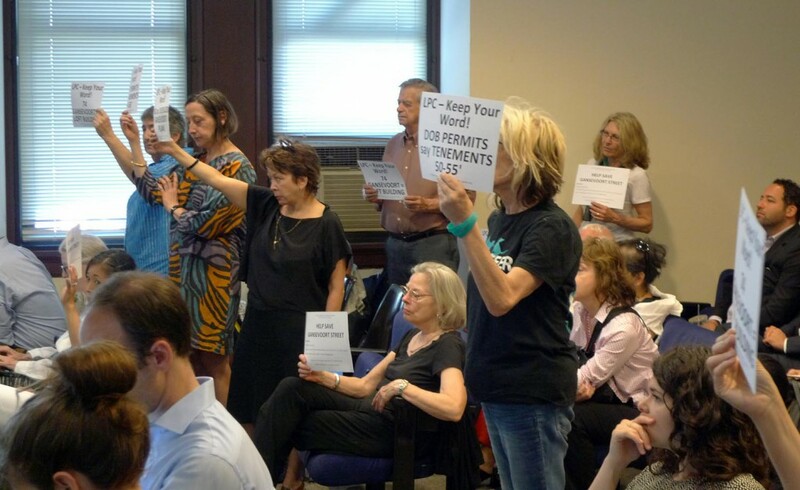 30 Department of Buildings Documents Say the Proposed Gansevoort Buildings are Too Big! We’ve just posted our analysis of the revised massive Gansevoort development proposal. 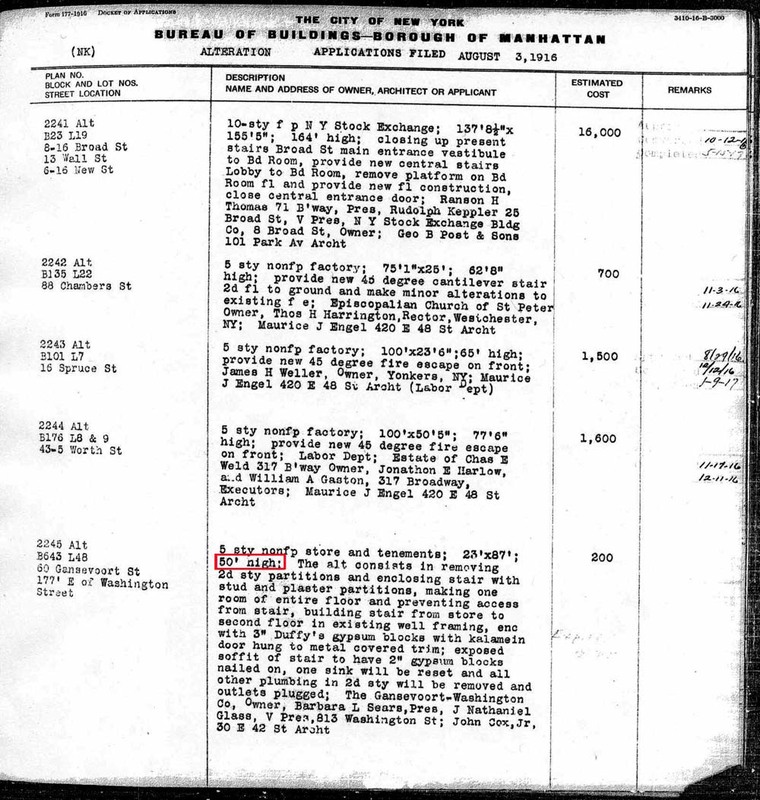 At its previous public meeting, the Landmarks Preservation Commission was very clear that the proposed building at 60-68 Gansevoort could be no taller than the previously existing tenements at this location, and that the height of the new building proposed for 74 Gansevoort (now 97 feet tall including mechanicals) needed to be significantly reduced. Yet in the developer’s revised plan, 60-68 Gansevoort is still about 10 feet higher than the old tenements, and the height of 74 Gansevoort (exclusive of the penthouse) was reduced by a mere two feet. 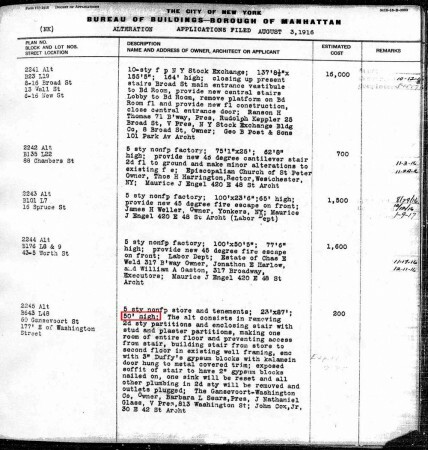 We’ve now found 30 Department of Buildings records showing that the old tenements were between 50 and 55 feet high. 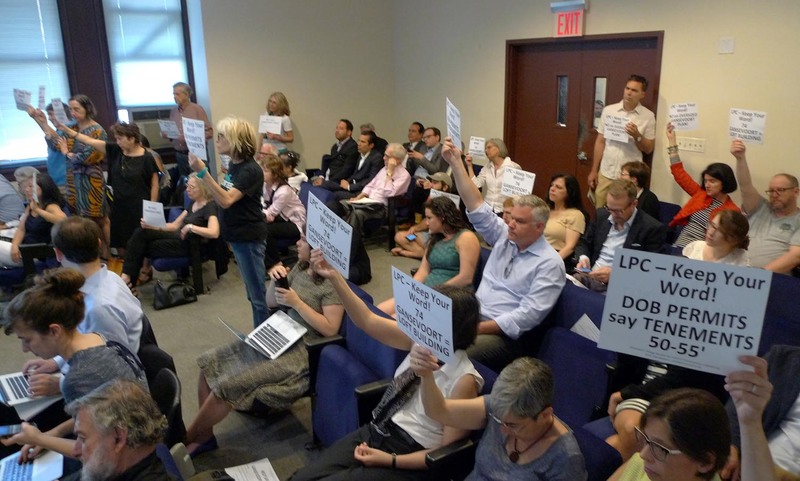 We strongly disagree with LPC’s decision at the previous meeting to arbitrarily reach back to an earlier stage in the district’s history in order to justify replacing existing low-rise market buildings with massive new construction. Nonetheless, if the rationale is to return Gansevoort Street to its earlier tenement configuration, then the new buildings at 60-68 and 74 Gansevoort must conform to the size of their predecessors. There is no excuse for allowing the developer to exceed the extremely generous guidelines which LPC previously established simply to increase his own profits. The Commissioners will question the developer about his revised proposal, and then either vote to accept the proposal or send it back for further revisions. 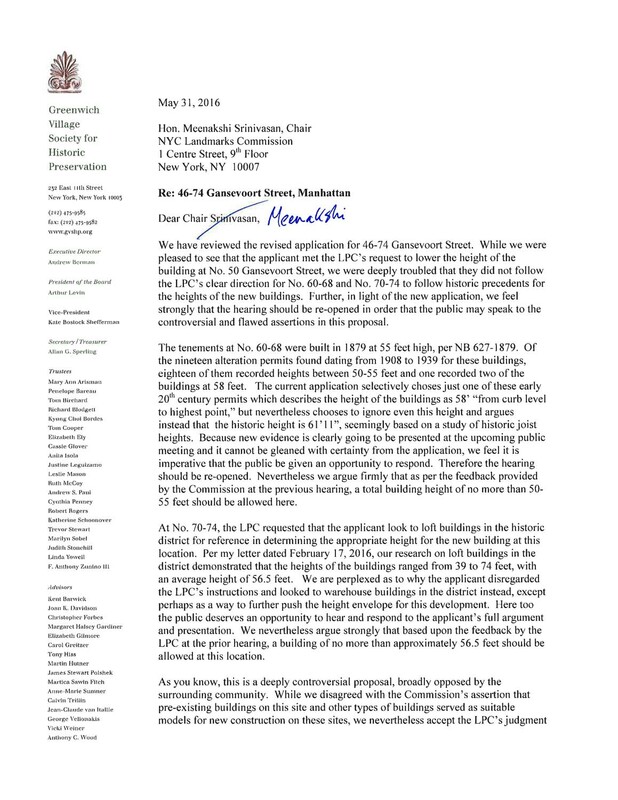 We strongly believe this proposal fails to meet the guidelines established by the commissioners at the previous public meeting on the Gansevoort application, and that the commissioners should insist it be further revised to significantly lower the heights of the proposed new buildings at 60-68 and 70-74 Gansevoort Street. The public will be able to attend (but not speak at) this meeting. WE NEED A GOOD TURNOUT TO REMIND THE COMMISSIONERS HOW STRONGLY THE COMMUNITY OPPOSES THIS MASSIVE DEVELOPMENT. We will have stickers and signs so that the commissioners know that we want this project radically revised. As you know, this is a deeply controversial proposal, broadly opposed by the surrounding community. While we disagreed with the Commission’s assertion that pre-existing buildings on this site and other types of buildings served as suitable models for new construction on these sites, we nevertheless accept the LPC’s judgment in these cases. However, to allow the applicant to then twist and circumvent even that very generous directive would be an outrageous abridgment of the public’s trust and a blow to the integrity of the process. 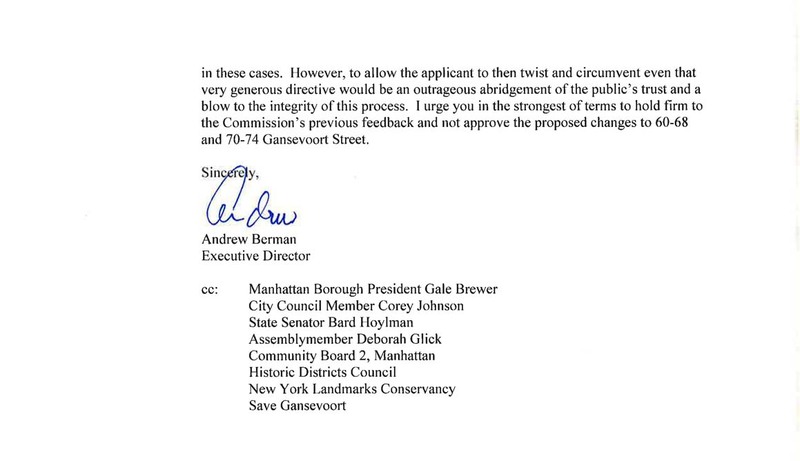 I urge you in the strongest of terms to hold firm to the Commissions previous feedback and not approve the proposed changes to 60-68 and 70-74 Gansevoort Street.